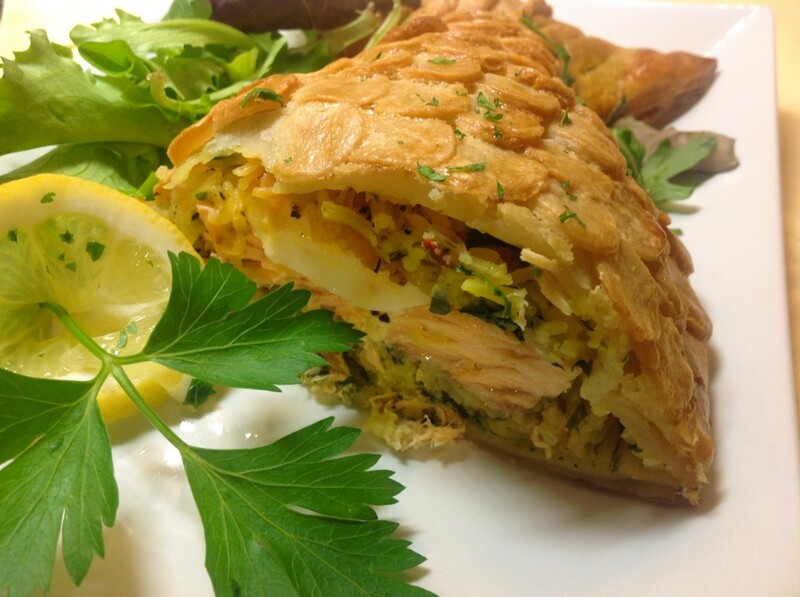 Adapted from the Russian Koulibiac, a salmon, rice and egg pie, this puff pastry pie can be prepared in advance and then baked before serving. In this recipe I have used ready rolled GF pastry (Dr Schar) which in my opinion, has a slight gf aftertaste. It neither puffed up that much. I was very disappointed as did not find the pastry too light either. I was in a rush so had to buy ready rolled, but next time I will make it with my own puff pastry. True it will take a little more time, but it will be worth the effort. Boil the rice until tender. Drain, let cool and then add the melted butter, panna and finely chopped spring onion to the rice. Season with salt & pepper, chilli if using, some parsley, some dill, a little zest and juice. Combine well. Season the salmon lightly and cook, either by steaming or poaching or else in the oven, whichever way you prefer. Leave to cool. Flake gently. Set aside. 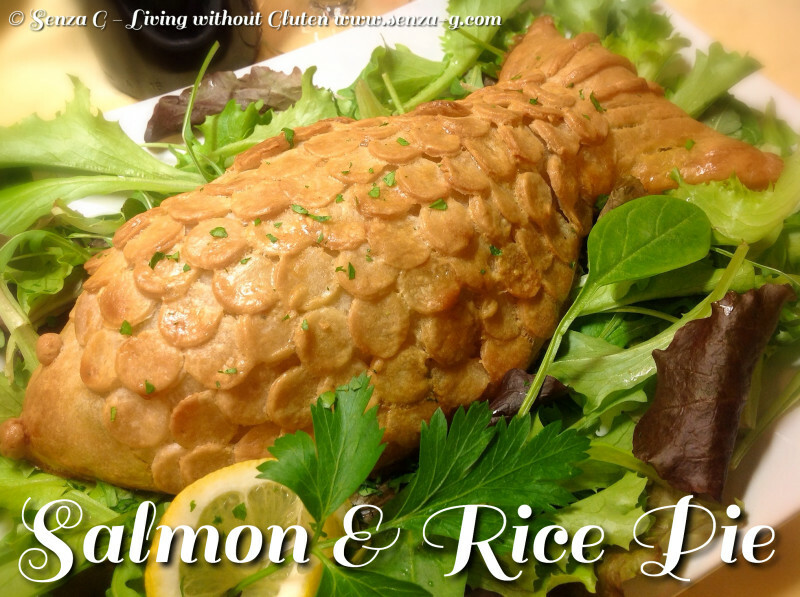 Take the gluten free pastry sheet and divide in half. Turn the sheets diagonally that way fish shape will be longer. Cut out using a sharp knife, a fish shape out of one of the pastry sheets. Put the cut fish shape on top of the other sheet and cut another shape but slightly larger than the first one. Put the smallest of the fish shapes onto a lined baking sheet. Set the leftover pastry aside. Start layering most of the rice on top of the first fish shape, leaving a border around the edge. Put the flaked fish over the top of the rice and then layer the sliced boiled eggs on top. With the remaining rice fill any gaps left. Season with salt & pepper and more herbs if you wish. Brush beaten egg around the border and then carefully place the second fish shape over the top. Gently seal the ends by pressing down either with fingers or the prongs of a fork. From the remaining pastry, cut out as many small circles as you can using a small cookie round cutter or a bottle cap. 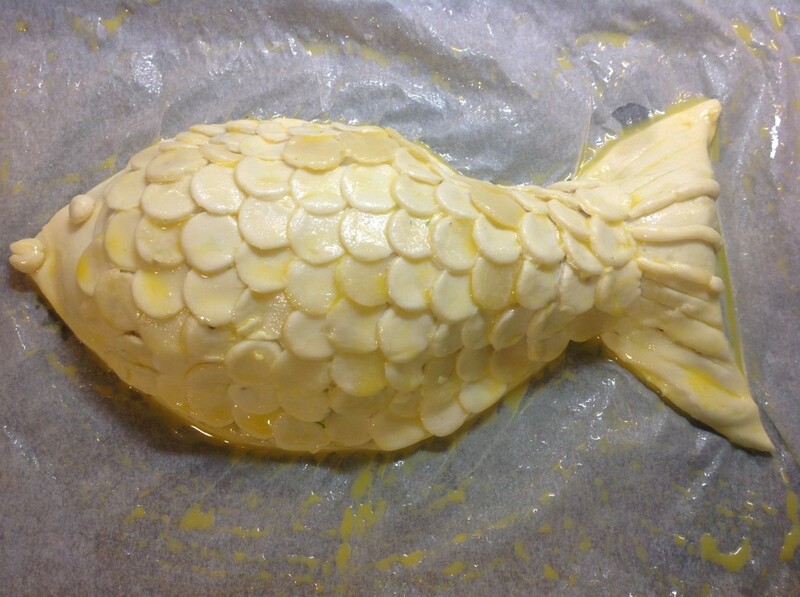 Brush the top of the pastry with beaten egg and start placing the circles which should overlap to look like scales. Make an eye and a mouth and strips/lines in the tail. See picture. Brush again with remaining beaten egg, place in the oven and cook for about 25 to 30 minutes or until the pastry turns golden.